The other thing as well is that all “recommended charms” (the stuff you deploy with Juju) are peer reviewed by Canonical employees, and, as I found out tonight, are automatically tested on a range of cloud services with each commit. One of the bigger problems we found with Puppet over the years was finding Puppet modules that were built in a way that allowed easy deployment on my operating system of choice without hacking to move it out sync with the upstream maintainer. Of course you can still do this with Juju, but the charm developers add sensible properties into their charms in the hope this wont be necessary. You can also extend charms with their new “layers” approach coming in 2.0, if you come from a programming background, think of inheritance, you can extended charms with more code, without writing all the other stuff or copying and pasting. 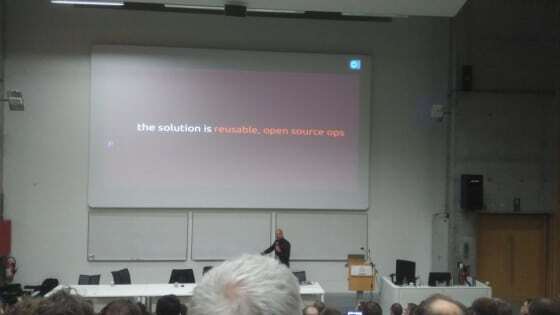 The other take away from today, is how enthusiastic all the folks at Canonical are about their product. This is from the top down, from Mark Shuttleworth, wanting to do seat of the pants demos with the Ubuntu Orange Box(http://cluster.engineering/ubuntu-orange-box/) and answering questions in detail on the mailing list. To Jorge and his love of ZFS, Antonio and his wanting to demo the Juju Weather Report to me so I understand how the cross cloud testing metrics work and of course Marco Ceppi who thinks(quite rightly) that every question is a really good question and answers it in as detailed way as possible, how he didn’t loose his voice is beyond me. I have to be honest with you, when we were asked to write a Saiku charm, I was sceptical, YACMS(yet another content management service), but the whole ecosystem has changed from, “let’s write a charm and hope people consume it”, to, “lets port our systems to Juju because it makes our lives easy and if people use our charm thats a bonus”.